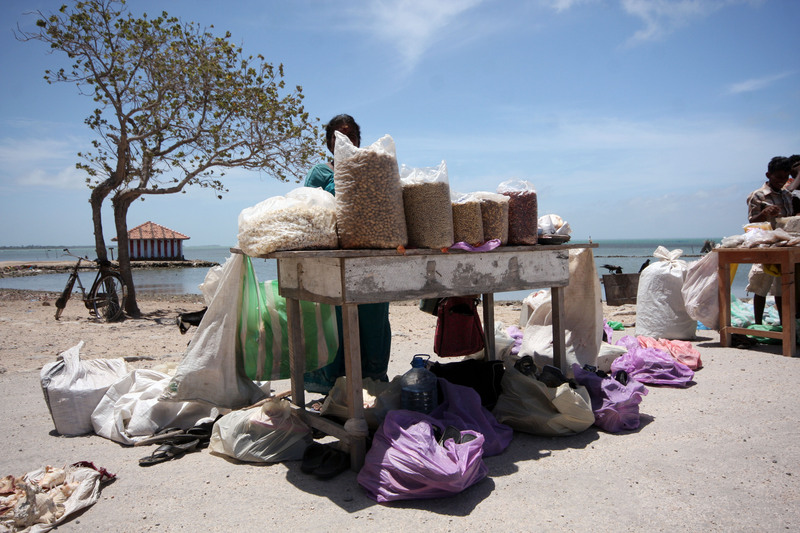 Within minutes of leaving Jaffna’s central bus station, the bus to Kurikadduwan began crossing a causeway over to Kayts island. Out of the city so suddenly, surrounded by sea, I immediately felt enormously happier and more relaxed. It was a beautiful journey. 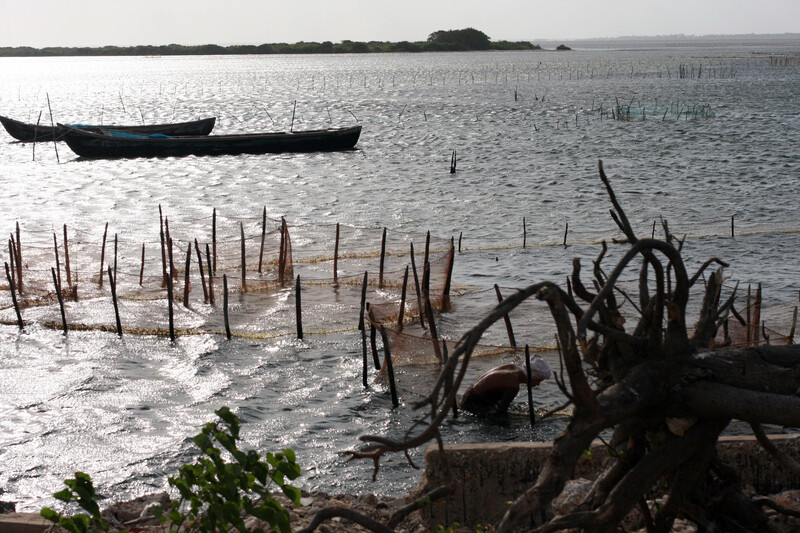 Fishermen stood waist deep in the water, pulling in nets. Egrets, herons, storks and ibis strutted in the shallows. I got down in the village of Punkudutivu which, it turned out, stretched along the road for about 4km. It was full of once handsome, now deserted, colonial-era houses. The few people I met looked at me in amazement as I wandered around abandoned gardens under the hot sun. Many of the houses had been damaged by bombs or bullets and had lost their roofs, but they still retained enough of their original features to give them a sense of dignity. 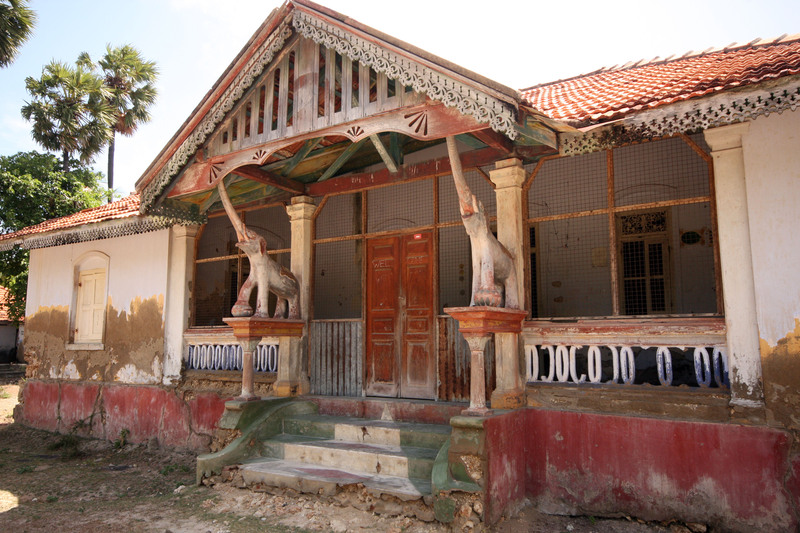 One dilapidated house, near the Church of India, has two carved wooden elephants holding up the porch and I was taking a photograph of it from the far side of the fence when a very tall man came out of a nearby house and invited me in. 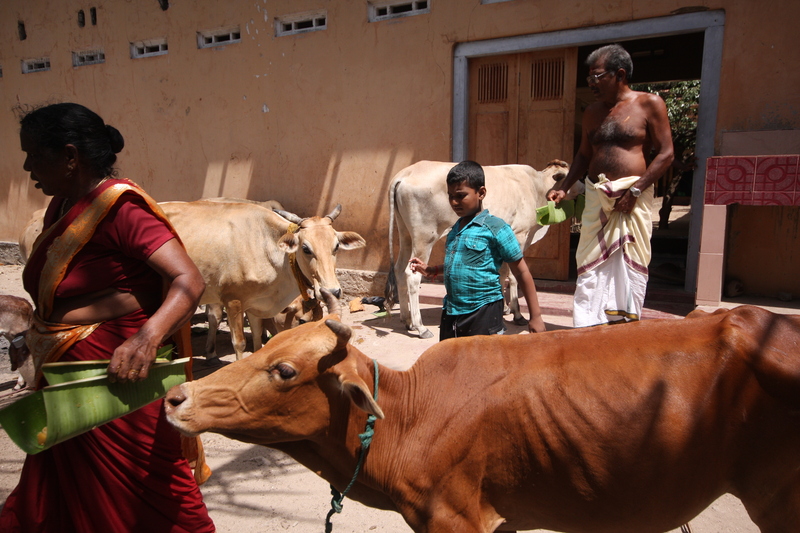 The man’s name was Ampalavanar Rajanaimalan and he looked after both the elephant house and the Church of India. He told me he had lived in Colombo for eight years but came back here in 2002. He showed me inside the Church of India, a pretty little building with flower bushes growing outside the door. Inside it was almost empty, with just a simple altar and a lectern. In place of the pews there stood an ordinary wooden table with some plastic chairs around it and papers strewn on top. The army check-point next door had started a small cafe so we walked over there and Ampalavanar bought me a ‘nestomalt’, in lieu of there being any tea. The tall priest’s son spoke fluent Sinhala, having lived in Colombo so many years, and he stood joking with the Sinhalese captain. 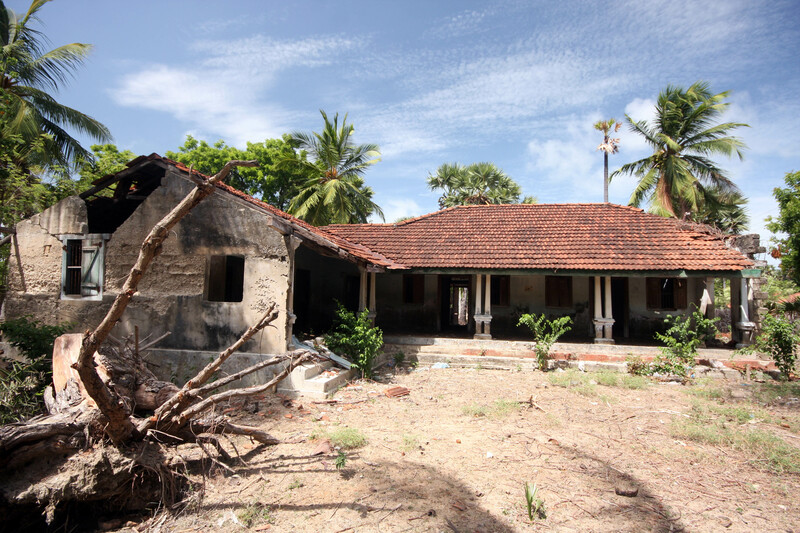 It seemed strange to see a large group of armed soldiers in this quiet, almost empty village, but there were riots here in December 2005 after a local young teacher was raped and murdered, allegedly by the Sri Lankan Navy. Ironically, the military cafe is now the liveliest place around. I hopped onto a bus for the short distance to the ferry port at Kurikadduwan (KKD), then waited for a boat over to Nainativu (or ‘Nagadipa in Sinhalese). It was only R20 for the twenty minute cruise to the island, aboard a boat hand-painted with flowers. You can also catch a boat to Delft island from KKD, but the boats leave less frequently and the journey there takes an hour. Delft is ‘run’ by a notorious local politician known as ‘Dougy’. It is famous for its herd of wild Delft ponies. 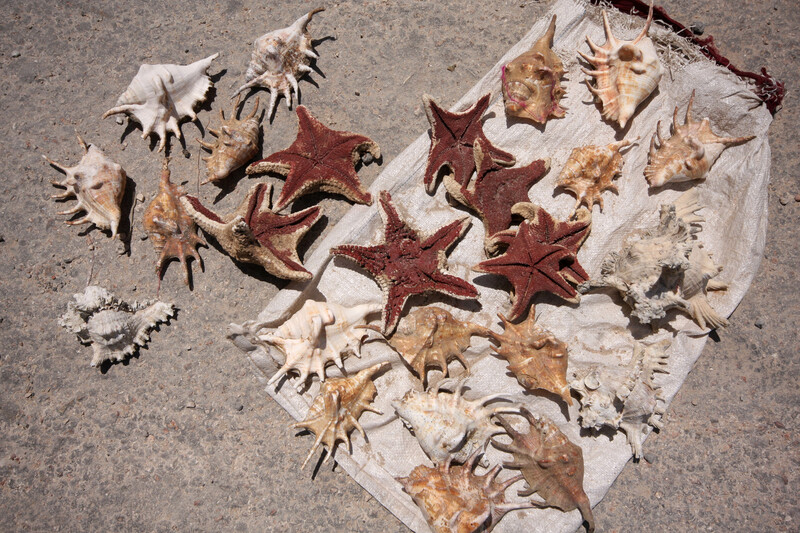 After disembarking at Nainativu I left my shoes beside a stall on the very windy pier, where a woman was selling cashew nuts, puffed rice, shells and dried starfish. 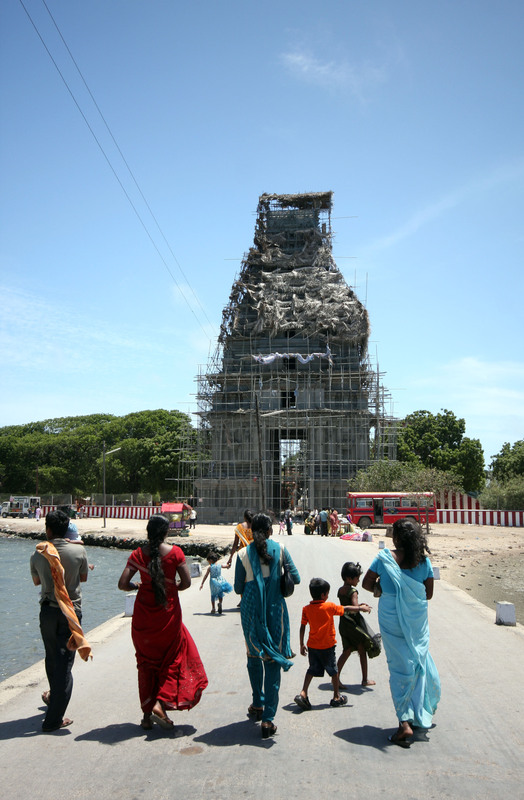 The Naga Pooshani Amman Kovil is just beyond the pier and is an important temple for Hindu Tamils. When I arrived the midday puja was taking place and the temple was packed. 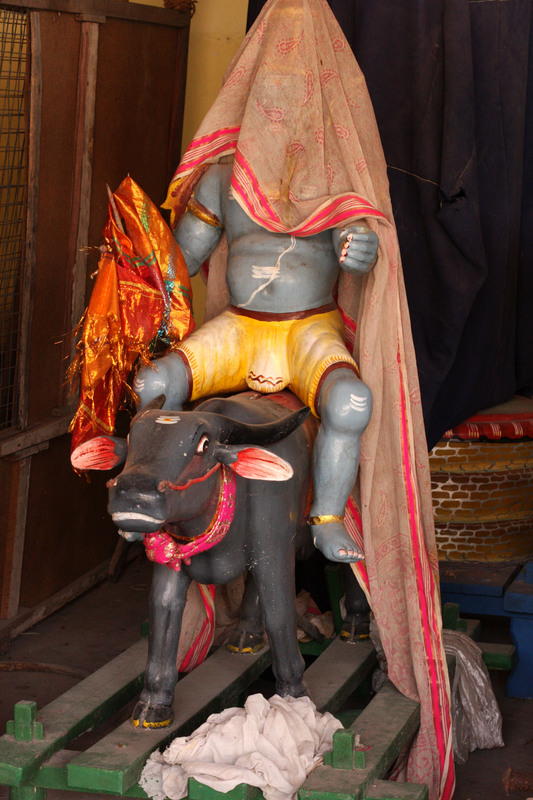 Drums were banged; bells rang; men walked around bare chested (men have to remove their shirts to enter); old women prostrated themselves before the deities; everyone made offerings of fruit or flowers; and a queue formed for blessings from the priest. The atmosphere was incredibly friendly and welcoming. 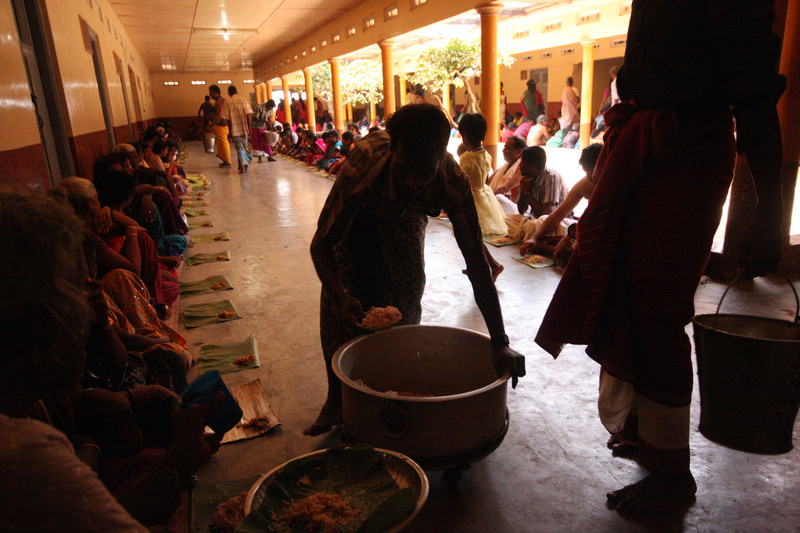 Afterwards, under the porch outside, another priest gave out prasad – food that has been blessed. In this case it was sweet rice with nuts and raisins, and very tasty. I was given an enormous scoop of the mixture, which I wrapped in a banana leaf. I didn’t eat much of it, however, because immediately afterwards I went over to the canteen building for a delicious vegetarian lunch. 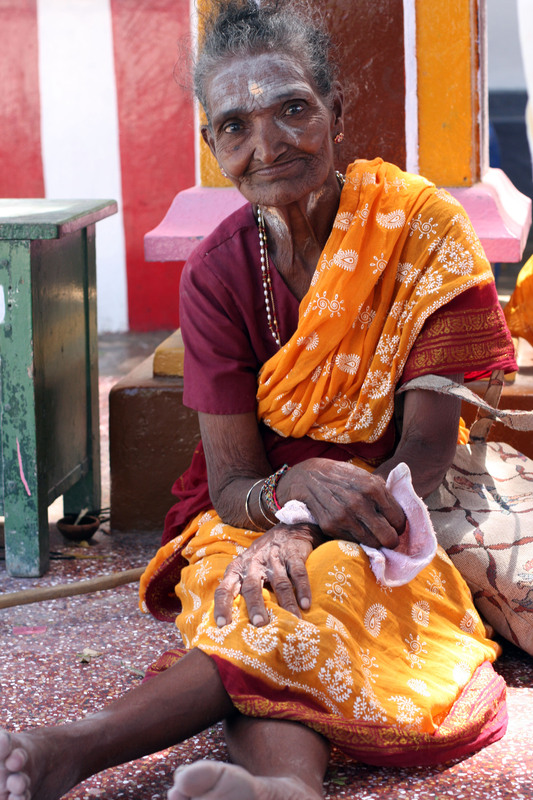 Lunch is served every day at this temple, prepared by volunteers using vegetables grown on the island. There is no charge, but I’m sure the cost is covered by donations. Many of the people at the temple were Tamils visiting from abroad and several families approached to speak to me in Canadian accented English. A young guy wearing nothing but a white sarong around his waist, painted with stripes of puja powder on his face and arms, came up to me speaking with an Essex twang. He was born in England and here visiting relatives. Since I was the only obvious foreigner I was the object of much curiosity, and special treatment in the canteen. One of the women doling out food gave me at least ten poppadoms! Outside the back door cows were waiting to munch on the leftovers. The temple is dedicated to Meenakshi, the naga (serpent) goddess, one of Shiva’s consorts, who is associated with children and fertility. 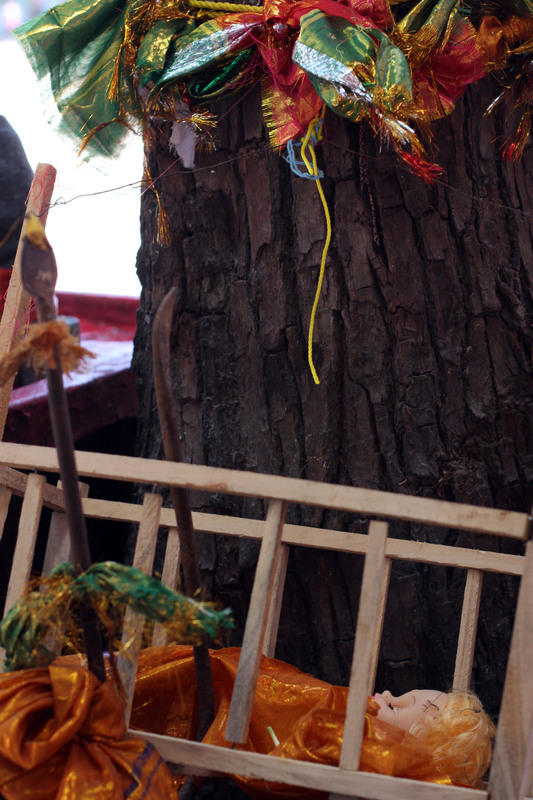 Many women come here to ask for blessings to conceive a child, and they tie ribbons or miniature cradles, some containing plastic dolls, to a tree outside the temple door. Coconuts are smashed to complete the ceremony. 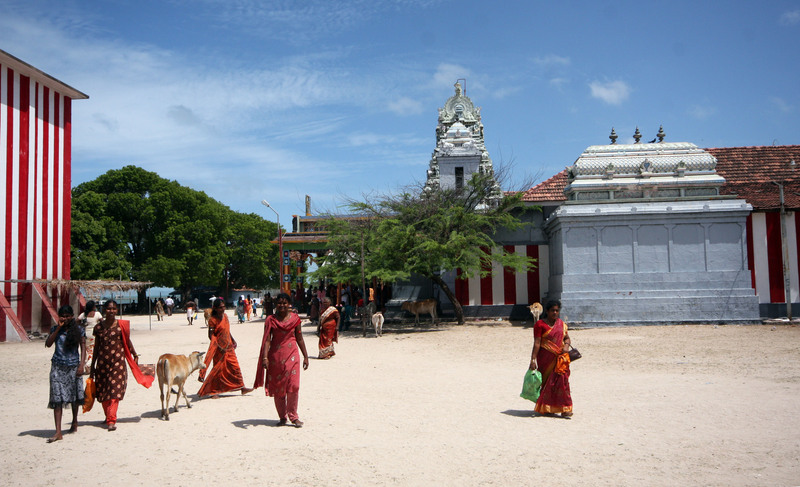 The island is also sacred to Buddhists because of the Nagadipa Temple, which is a short walk away along the coast. There is a silver-painted dagoba and three Buddha statues in a temple. 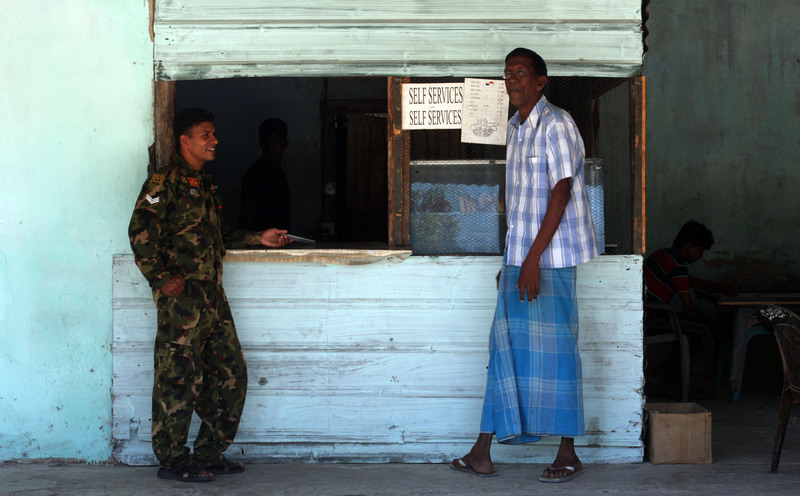 Since hostilities ended, increasing numbers of Sinhalese tourists are coming here to visit, curious to see the north. 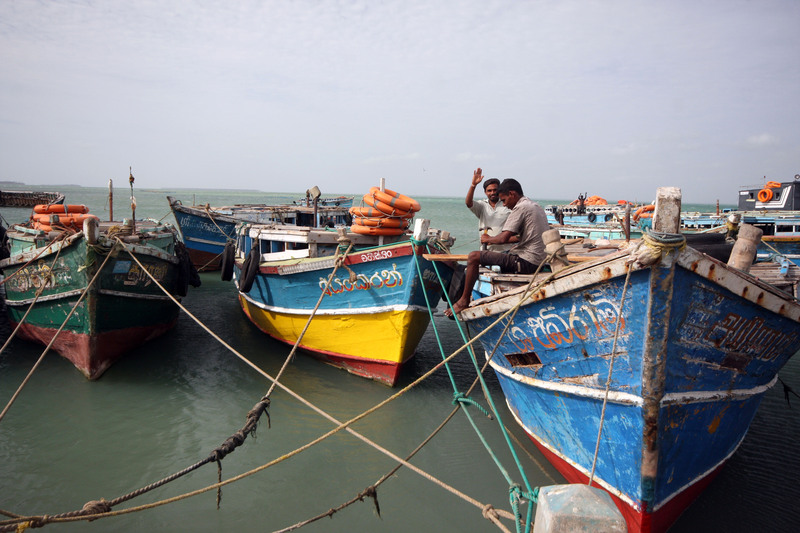 On the boat trip back I talked with a Canadian Sri Lankan man who had left Jaffna in 1991. This was only his second trip ‘home’ and he said that it was now impossible for him to live here again. His children had been born in Canada and were fully integrated there. He was trying to teach them Tamil but he spoke English almost all the time now and he even forgot the words sometimes! This fragmentation of a culture seems quite sad. There were some very inferior postcards of Jaffna on sale at the pier and I bought three.